"I am the Bread of Life. I am the Light of the world. I am the Good Shepherd." Jesus did not have an identity crisis! He knew who he was and why he had come. Regardless of circumstances or the opinions of others, he affirmed that he was the great "I Am" who existed before Abraham. There are many "I ams" we can also affirm. We have no problem with some: I am a son or daughter, a father or mother. Neither do we have difficulty with such "I ams" as I am a member of Fifth Street Church or the PTA. As Christians, we can affirm still others: I am a believer. I am saved. I am forgiven. But as we move into the area of feelings and life goals, our "I ams" tend to become cloudy. I am a witness for Christ might be prefaced by "sometimes." And even if we know God has called us to write, the statement, "I am a writer," might stick in our throats or be qualified by such words as "I think" or "I hope to be." Even established writers have days when they don't feel like writers—days when the fruit of their labors may not seem evident. Each spring I'm out in my garden as soon as the soil is no longer frozen. As I drop seeds into holes and push dirt around tender seedlings, I envision the bouquets of zinnias and daisies I will pick for my dining room table. So, too, we also need to envision the writer we hope to become and the work we hope to produce for the Lord's glory. More importantly, we need to envision the writer God wants us to become. I'm not talking about using visualization techniques but rather about a biblical principle: "What he thinks is what he really is" (Prov. 23:7 TEV). I've seen it proven many times. When I wound up on the wrong side of the bed and pictured myself becoming irritable with the children and getting nothing accomplished, my expectations were not disappointed. My children are now grown, but the principle is still the same. What I think in my heart is what I become! But what is true of negative thoughts, is also true of positive ones. When my mind is centered on Christ and I choose to rely on "his mighty power," I discover that he "is able to do far more" than my "highest prayers, desires, thoughts, or hopes" (Eph. 3:20 TLB). Making it happen involves more than just desiring to see it happen. It also takes realistic and planned action. Periodically I take time apart with the Lord to assess where I'm at and where I need to be heading. I find it helpful, first, to set long-range goals. 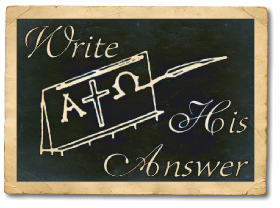 What is God's overall plan and purpose for my writing? Where does he want me to be five years from now? From there I break it down into specific and measurable short-term goals. When I first started writing, those goals included: growing in my Christian walk, keeping a journal, studying the craft of writing, researching the markets, and completing that first manuscript. The first four goals have been, and must be, ongoing. I have frequently changed and enlarged that fifth one to reflect new writing challenges. It has been said, "Attempt something so big that without God's help it will surely fail." In other words, we need to stretch beyond our comfort zones if we're to discover the joy-filled reality of "quietly depending upon the Lord for his help, and not on our own skills" (2 Cor. 1:12 TLB). Next, it's time to take a big step of faith and verbalize our goals to others. That's scary! I remember the first year I went to a Christian writers' conference and told people about the book I planned to get published. Although it must have been obvious that I had a lot to learn before I could hope to write— much less sell—a book, the instructors encouraged me to work at it. Other writers promised to pray for me. Another step in reaching our goals is to determine the necessary spiritual and practical preparation. Do we need to become more disciplined in our study of God's Word? Are we actively involved in a strong body of believers? Practical preparation might include taking an English refresher, attending a local creative writing class, enrolling in a correspondence study program, joining or forming a writers' critique group, or attending a conference. Anticipating obstacles and how I will overcome them is another important step. For instance, the telephone is one of mine. I love to talk, and I hate answering machines. I said I would never get one. Instead, I tried monitoring the length of my calls during business hours. I tried and failed! I've found that an answering machine is a necessary time-saver. So is the computer I said I never wanted. I find it is essential to regularly review my goals. Tucked away in a bottom drawer, they will be useless. But more important than whether or not we realize our goals and sell x number of manuscripts is the manner in which we do our work and the foundation on which we build our writing ministry. We can never become so consumed by our goals—by what we want to do for the Lord—that we neglect what he wants to do with us. Prayerfully setting goals, putting them in writing, sharing them with others, and determining the specific things we need to do to make them happen is just the beginning. Then, as David told Solomon when he gave him the blueprints for the temple, we must "be strong and courageous and get to work. Don't be frightened by the size of the task, for the Lord my God is with you; he will not forsake you. He will see to it that everything is finished correctly" (1 Chron. 28:20 TLB). I am a writer! I am endeavoring to present the Good News of Jesus Christ through the words I write. I am matching my prayers with hard work. When I get discouraged, I remind myself to claim his promises and trust him to make it happen. Proverbs 16:9 says, "We should make plans—counting on God to direct us." Click on the goal planning chart link below; then go before the Lord and ask him to show you what he wants you to do (Jer. 29:11-13). And remember, "Pray that he'll fill your good ideas and acts of faith with his own energy so that it all amounts to something" (2 Thess. 1:11, The Message).